According to the Boston Public Health Commission‘s (BPHC) Walk This Way website, there are an estimated 2 million pedestrians in the City of Boston every day. Only about 600,000 people call the City of Boston home, but when you factor in workers and visitors to the city the number reaches roughly 2 million every single day. With that many people walking through the city, Boston pedestrian accidents are likely and unfortunately going to happen. For that reason, the Walk This Way website is here to offer pedestrians in the city with some safety tips, quick facts and useful information to help to reduce the risks of pedestrian accidents in Boston. Our Boston pedestrian accident lawyers understand that Boston roadways and sidewalks can be quite the hazard. According to the Governors Highway Safety Association, there were nearly 50 pedestrian fatalities in 2009. 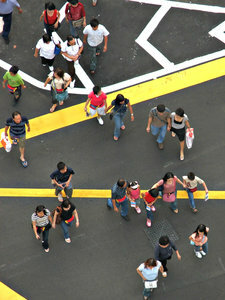 During the first 6 months of 2010, there were already 25 pedestrian fatalities reported. With the cooperation of both motor vehicle drivers and pedestrians throughout the city, we can help to reduce these accident risks and make a city of safer travel for everyone. -Only about 12 percent of pedestrians in the city wait for the “Walk” signal before crossing the street. -Nearly 35 percent of pedestrians jaywalk at least 5 feet from a crosswalk. -Approximately 95 percent of drivers yield to pedestrians when these on-foot travelers have the right-of-way. But only about 50 percent of drivers yield to pedestrians who cross against the light. Even fewer drivers slow down for jaywalkers. The results of this study indicate that irresponsible pedestrian and driver behavior is a part of the dangerous risks for pedestrian-traffic accidents in the city. These habits are easily corrected with a little conscious effort towards safety from everyone. -The crosswalk in the safest place to cross the street. -Check for traffic in all directions before stepping into a crosswalk to cross the street. -If you’re at an intersection with both a crosswalk and a traffic light, push the button and wait for the “Walk” signal before attempting to cross the road. -At intersections with a crosswalk without a traffic light, pedestrians have the right-of-way. Be sure that approaching drivers see you and come to a complete stop before starting to cross the road. -Use a sidewalk when one is available to you. -When a sidewalk is not available, walk on the left-hand side of the road facing oncoming traffic. -Always wear brightly-colored clothes or carry a flashlight with you when walking during the evening or early morning hours. -Keep a watchful eye out for vehicles that are reversing out of parking spots or driveways. -Remember that the fine for jaywalking in the city of Boston is $1. Pedestrians are urged to take the Walk This Way Trivia Quiz to test out their walking skills and to freshen up their walking knowledge for a safer commute. If you, someone in your family or a close friend has been injured in a pedestrian accident in the Greater Boston Area or elsewhere throughout the state, contact Massachusetts Personal Injury Lawyer Jeffrey S. Glassman for a free and confidential appointment to discuss your rights. Call 1-877-617-5333.